Bruton's fifth solo record delivers more of the Americana/blues that he's been doing since his first solo album, 1993's What It Is. Probably best recognized as a former sideman for everyone from Bob Dylan and Willie Nelson to Waylon Jennings, Bonnie Raitt, and Alejandro Escovedo, to name a few. But, as From The Five attests to, Bruton is a good songwriter on his own. Opening with a back porch blues rocker, "Bigger Wheel". And through the country rock of "Walk By Faith", the sullen country of "Treasured Wounds", and the folk of "The Halo Effect", Bruton commands the various roots genres and turns them into his own as he blends each into his Americana conceptions. 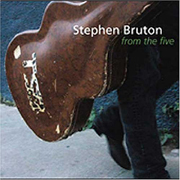 From The Five covers a lot of ground, including blues, country, folk, and rock 'n' roll, but Bruton, especially with his impressive resume, seems more than capable to travel through all, and more so seems most comfortable when he's doing a hybrid rather than a more straight-ahead number. And, From The Five is all about the roots hybrid. I'll give it a B.